Today we are introducing Luli Bunny's newest set with Mama Elephant. Pretend Play is a super cute set with a boy and a girl and tons of wearable accessories! It kinda reminds me of those dress up dolls! 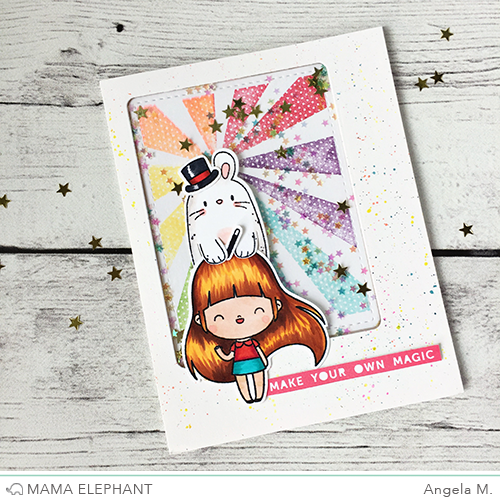 Angela paired the Page Huggers set with the Pretend Play set to create this magical shaker card! So who's the actual magician? The bunny or the girl? Too CUTE, and your Copic coloring is just beautiful, Angela! Such a darling card! Wow.I'm so intrigued how she got that polka dot sunburst background. I don't think it's patterned paper. So pretty! Great card. OMG they are super cute!! They are definitely on the gotta have list!! Such a gorgeous background on this terrific card!